In April, we got 6 baby chicks. The other day, we got our first little egg! It was just a bit smaller than a tablespoon in size and about the cutest egg I’ve ever seen. 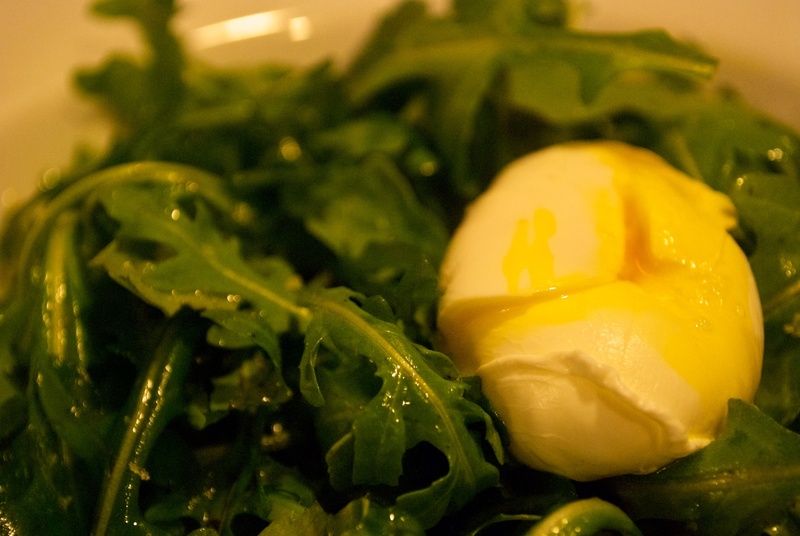 One of my favorite ways to enjoy fresh eggs is poached and plopped on a salad of fresh greens, especially arugula. It makes for a quick and easy lunch. YUM! Mix a couple handfuls of fresh arugula with sea salt, fresh ground pepper, good olive oil and white wine vinegar. Poach your egg. While it’s still warm, add it to the salad and dust with a bit of salt and pepper. Cut it open and enjoy with sparkling water. Simmer a few inches of water in a pot. Add a few splashes of white vinegar (this helps hold the egg together when you put it in). Crack your egg open into a small dish. This will make it a lot easier to put in the water. You can do it directly from the shell but I think it’s a lot harder. Once the water is simmering, take a spoon or spatula and create a whirlpool in the water. Gently place the egg in the center. The spinning should help the egg stay together. If it still separates, you can use your spoon to push the whites gently back toward the yoke. 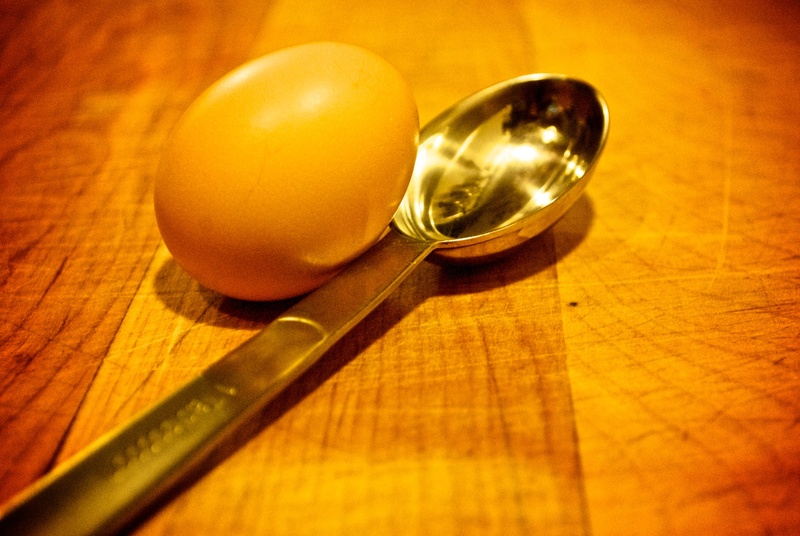 The egg will take anywhere from 3-5 minutes to poach, depending on the size. I think this tiny one actually took about 2 minutes, but most eggs are bigger! To tell if it’s done, you can use a slotted spoon to take it out and gently touch the top (you can also do this in the water with your spoon). You want a bit of a jiggle, and you want the whites to be white, not transparent. Poached eggs are good on so many thing and as our chickens lay more we’ll be making them in many ways in The Rainy Kitchen. Stay tuned! Figs are in season. YUM! 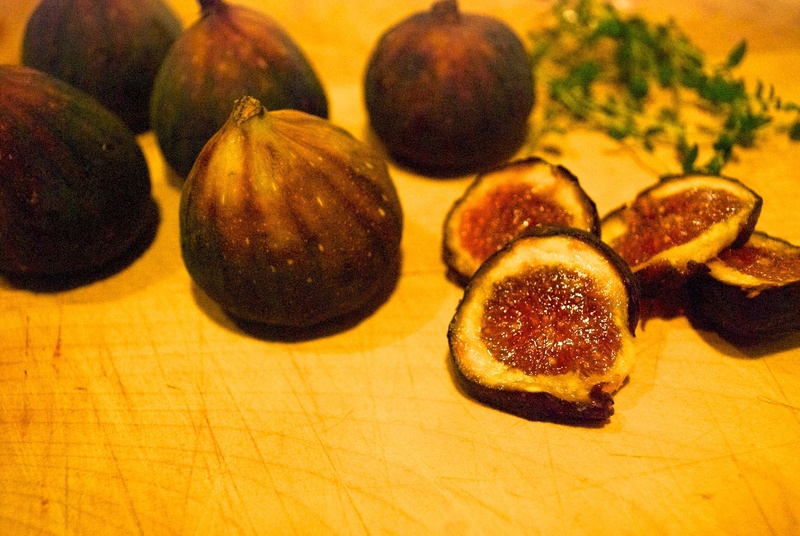 Figs are delicious and so good for you. I also love that they happen to be totally beautiful, both inside and out. Lately I have taken to keeping frozen puff pastry on hand (store bought) which makes putting together a quick galette hors d’oeuvres no problem. This is what I’ve been doing with the figs. It’s simple to make and quite yummy (and very pretty if I do say). Preheat oven to 375. Take the puff pastry out of the freezer and follow directions for thawing. While the pastry is thawing, thinly slice the onion and put it in a pan to caramelize with a bit of butter. Meanwhile, put the goat cheese in a bowl. Add Grand Marnier, 1 tsp chopped fresh thyme, and the Garam Masala. Mix together. Use a rolling pin to stretch out the thawed pastry just a bit. Put it on a cookie sheet lined with parchment paper and use a fork to poke holes all around it. Put the goat cheese mixture in the middle and spread it out evenly with your fingers, leaving about an inch around the edges to fold over later. Slice the figs and lay the slices evenly over the goat cheese. Lay the caramelized onions around the whole thing. Fold over the edges gently and brush with egg white. 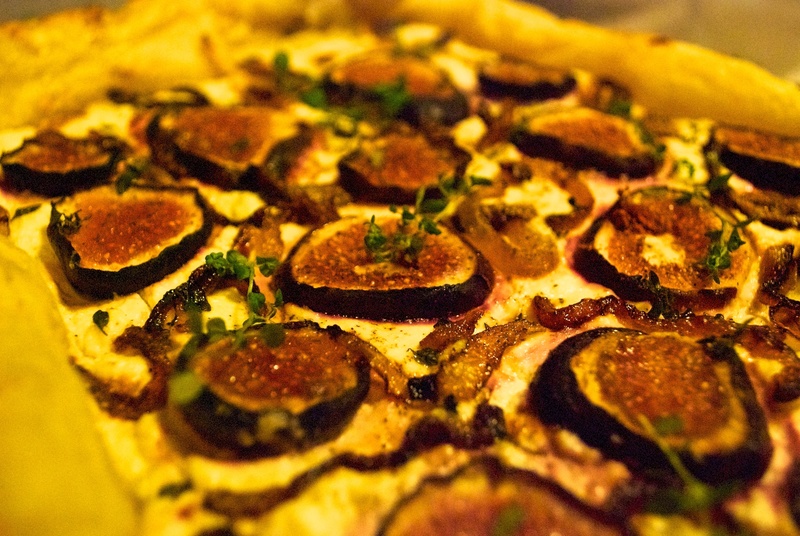 Put in the oven for about 20 – 30 minutes or until the figs get a nice color to them, and the pastry is golden around the edges. You can remove mid way and brush with more egg white if you’d like. Let cool and add sprigs of fresh thyme. Slice into wedges before serving (this is extra easy if you use a pizza cutter). As we’ve already talked about on this blog, ’tis the season for delicious summer tomatoes. Gazpacho is one of my favorite ways to enjoy them. This meal feels so healthy to me. Our house has been battling the summer cold that seems to be going around, and all the raw veggies in this dish, including garlic, make it great for fighting off what ales you. The other especially great part about this meal, is that it takes about 15 minutes to prepare. I fantasize about eating it somewhere in Spain someday, but until then, The Rainy Kitchen will have to do. Halve tomatoes and pulverize them in a Food Processor. Pour them into a large bowl. Peel and seed the cucumbers and do the same. Chunk the bell pepper and do it again. It’s important to do all of these veggies separate, as they all take different amounts of time. Do the garlic and onion together. Once it’s all in the bowl, add the olive oil and juice of the lemons, stir in slowly, giving yourself time to watch it all come together. 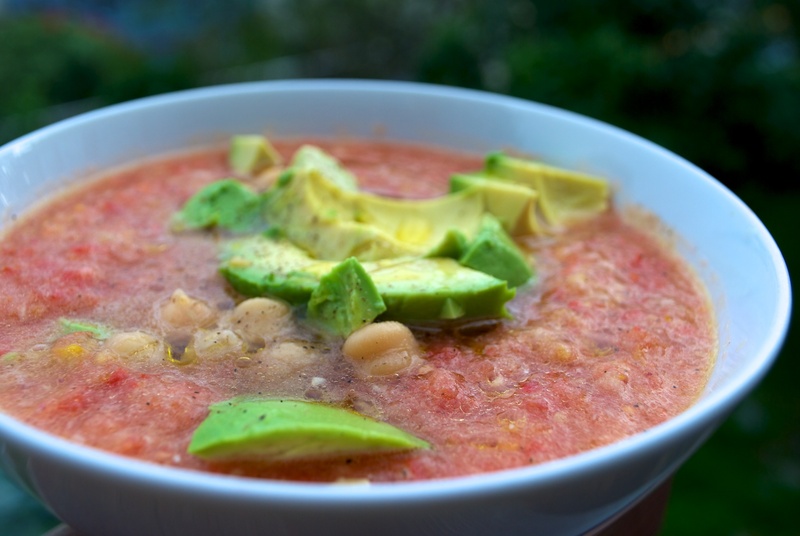 When serving, add a handful of garbanzo beans and half an avocado. Drizzle with a bit more olive oil, and finish with fresh cracked black pepper. Enjoy with your favorite delicious hard crusted bread. It was a busy weekend for our household, entailing woodshed building and our little Chihuahua, Rosie’s first agility trial. We had plans to have a friend and son over for dinner on Saturday night. After a day of running Rosie in the rain and digging in the dirt with my husband, I wanted to make something simple. Thanks to my dad, we had some fresh halibut in the freezer. I decided to make this dish because I knew I had all the ingredients in the house and it wouldn’t require running to the store. Here’s what I did. Preheat oven to 350 degrees. Put the halibut in a roasting pan. Drizzle with olive oil and season with sea salt and freshly ground pepper, making sure you get both sides. Place pads of butter on the halibut, leaving an inch or so between pads. Squeeze the juice of one lemon over the fish. 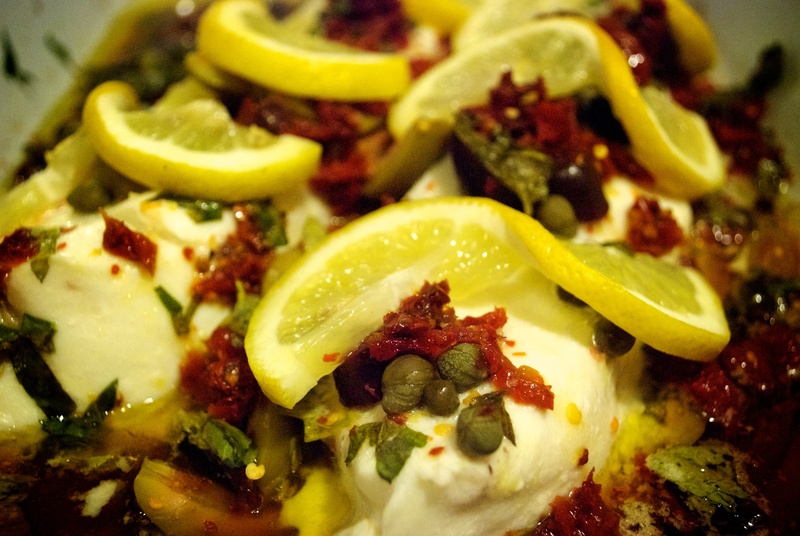 Add chopped garlic, green and Kalamata olives as well as chopped sun dried tomatoes. Lay a slice of lemon over each pad of butter. Sprinkle crushed red pepper over the whole thing. Pour the white wine in the bottom of the roasting pan. Cover with aluminum foil and put in the preheated oven. Cook for 15-20 minutes depending on the thickness of the fish. Take out when the fish is still a tiny bit translucent in the center. Remove, uncover and let finish cooking on the counter. Squeeze more fresh lemon juice over entire thing and serve. 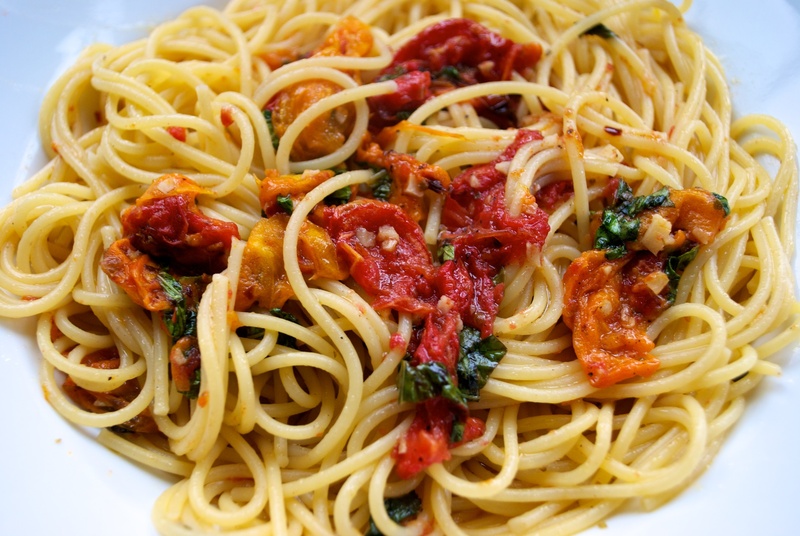 I cannot resist making pasta dishes with the delicious tomatoes that are in season right now. Even here in Juneau, our local health food store get’s a lovely selection of heirloom tomatoes this time of year. Here is a simple sauce that highlights these delicious fruits of summer. Preheat oven to 400 degrees. Slice the tomatoes into 1/2 inch thick rounds. Place a baking rack on a cookie sheet, and lay the tomato slices on the rack. Sprinkle with sea salt, drizzle with oil and put in the oven for apx 45 minutes or until tomatoes begin to caramelize. Remove from oven. Meanwhile, coat the bottom of a pan with olive oil (about 1/8 of a cup) and saute minced garlic. Add about 2 tsp of crushed red pepper (more or less depending on how much heat you like), a large pinch of dried oregano, and a pinch of fresh ground black pepper. Saute on low heat until the garlic is cooked. Add the tomatoes and chopped fresh basil, let cook on low heat while you boil water and cook the pasta. Before straining the pasta, add a ladle full of pasta water to the sauce and stir. Once spaghetti is strained, drizzle with olive oil. Serve sauce over the spaghetti with feta cheese. Well, it’s Friday. It’s been a long week and we’ve made it! A classic cocktail we love to have on occasion in our house is the Sidecar. On a recent trip to New Orleans we learned a bit about the history of this delicious cocktail when I ordered one in a fabulous bar called French 75. If you go to New Orleans, you must go to this bar. The lead bartender, who created their bar menu, is truly a master at his trade and also has a dry and kind way about him that is hard not to enjoy. At any rate, after I had a perfect Sidecar, I asked him what I should try next that I might not have had before. He suggested a Brandy Crusta, and then handed me an old cocktail book with some history of the drink in it. 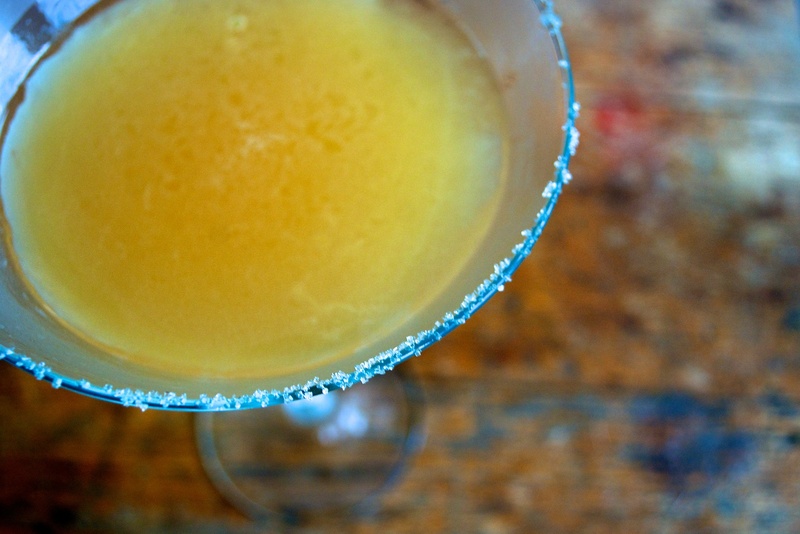 The Crusta was made with brandy, Cointreau and lemon, and served in a glass with a rim crusted with sugar. The Sidecar was a take off of the Crusta, only the brandy became Cognac. YUM! A variation on this traditional Sidecar is the Bourbon Sidecar, which is how we mainly make it in our house. If you haven’t tried this, do. It’s the perfect cocktail for a Friday cocktail hour. Chill martini glass in freezer. While the glass chills, pour bourbon, cointreau and fresh lemon juice over ice in a cocktail shaker (use lots of ice). Shake vigorously for a minute or so (I think one of the keys to a good cocktail is shaking it for a decent amount of time, count to 100 if you want). Remove glass from freezer, rub rim with lemon and dip wet rim on a plate of sugar. Strain cocktail into glass, serve immediately. I am in Anchorage for work right now. 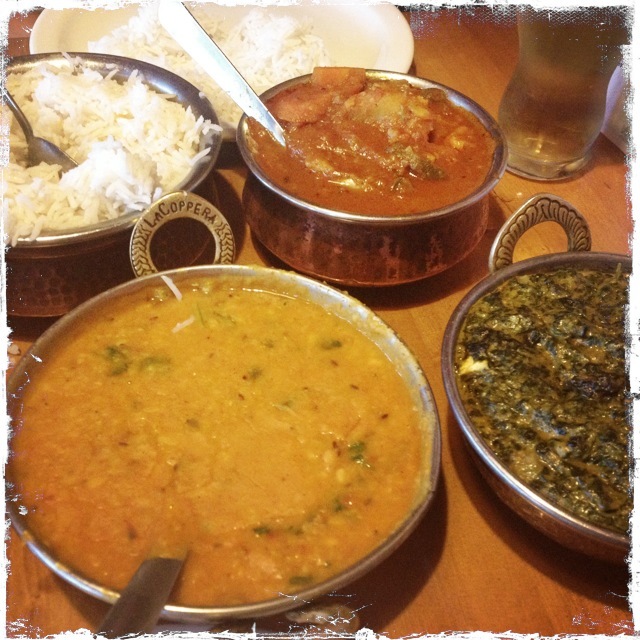 The best part of coming here is going out to get Indian food. The restaurant that I think makes some of the yummiest Indian food I’ve eaten, is called Bombay Deluxe. It’s a family run place and the food is authentic and delicious. The atmosphere is kind without a hint of pretentiousness. We have yet to convince the owner to open a restaurant in Juneau, even though we ask him every time! If you’re from Juneau, be sure to do the same if you come and eat here. Maybe we can convince him one day. Last night the place seemed busier than normal, apparently they are doing coupons on Groupon now, so that might be worth checking out. We had to wait about a half an hour for our table, but that gave us time to go next door and explore the Asian food market. My suitcase is now packed full of curries and spices to bring home. How fun! Our delicious meal. Next time you’re in Anchorage, go eat here. You will not be disappointed. So good!